We are offering a wide range of White Granite Slab which are mainly found in white color and grey / black specs mainly used for flooring and counter tops. We offer the range which is used for various indoor and outdoor applications and are known for durability, robustness, and resistance to wearing. This granite is finely processed under the supervision of our highly experienced staff. Further, this granite is available in various sizes, colors and textures as in slabs and tiles of different thickness and lengths as required by the clients. 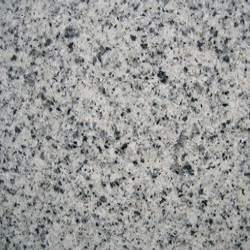 We are providing this granite as per the requirement of clients at very reasonable rates. Established in the year 1990, we, Ganesh Exim are manufacturing, exporting, importing and supplying a wide collection of Marble Slab, Tiles & Minerals. Our range includes Marble Handicraft Product, Granite and Quartzite Slabs. These products are fabricated using premium quality raw material using advanced machines and technology in compliance with latest market trends. We also ensure that the raw material is well tested by reliable vendors on various industrial norms. With our immense domain expertise, we are offering an extensive range of Granite, Marble and Minerals that are extremely treasured among the clients for their strength, dependability, robust construction and high performance. Our highly experienced team of professionals strives hard to understand the needs of our clients and provide all the products in compliance with latest market trends. To ensure their quality, purity, weather ability, durability and accurate dimensions, we test these products on various parameters. These products are available in various specifications of our clients at the most competitive prices. Our exporting countries are malaysia, bhutan, bangladesh i.e all indian subcontinent.